For 144 days people around the world have been captivated by photos taken by a man living in a small metal box. 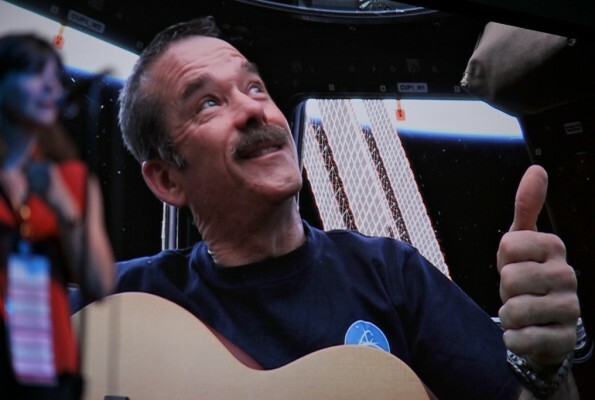 The man was Commander Chris Hadfield, and the metal box was the International Space Station (ISS), in orbit 250 miles above the surface of the earth. Between 21 December 2012 and the beginning of this week, when he began his return to earth, Chris took photos of the incredible sights he saw. He beamed them back to earth via Twitter, and soon became a hit on the social media site, gaining hundreds of thousands of followers. The irony was that for all the millions of dollars spent to send him to space, his fame was built on the photos he took not gazing into the furthest reaches of the galaxy, but looking back to earth. And what a sight he had to look back at. Commander Hadfield’s pictures were truly stunning. It is impossible to look at them without marvelling at the beauty and complexity of this little blue-green ball of carbon spinning in space. We saw snow-capped mountains and the wind’s patterns in thedesert sand; every imaginable shade of blue in the oceans and crazy streaks of red in the Australian outback; ranks of clouds queuing patiently over Hull and the moon rising above the “only planet we have ever called home”. Science fiction writer Douglas Adams once imagined a “Total Perspective Vortex” in which a person would be given a momentary glimpse of the size and complexity of the universe and him- or herself in relation to it: “An invisible dot on an invisible dot, infinitely small.” The experience, he surmised, would fry your brain. We have an aching need to feel that we have significance, that in some way we matter to somebody, somewhere. The idea that we can’t even be seen from the ISS is humbling, and can be crushingly so. The good news, though, for us and our friends, is that the God who made it all is also the God who sees us. You’re not an invisible dot on an invisible dot, you’re a precious child, known and beloved. And that makes a world of difference. This post originally appeared as the Evangelical Alliance’s Friday Night Theology email. Beautiful Jennie and so true. We have a God so great we can’t even begin to grasp all that He is but yet we are still special to Him. Amazing…and humbling.